Once again, it's Wacky Wedding Wednesday and today's story does NOT disappoint. Remember that old Jeffrey Osbourne song, "On the Wings of Love?" Well, one British couple must have taken that sentiment literally. 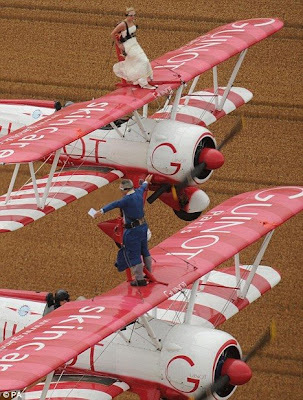 Here they are taking their vows while strapped to the wings of two separate biplanes over Lancashire, England. Their pastor flew ahead of the couple on the wings of a third aircraft. The whole affair was apparently the brainchild of the groom who thought the experience was exhilarating. "We got engaged in the Brazilian rain forest and I wanted a wedding blessing that would top my proposal." Oh. Really.